Finally.. It’s time for some Casimir history. I’ve been making and modifying toys all my life, but I didn’t pursue it with serious intent until about ten years ago. At the time, I had just returned from my stint on Sesame Street in New York, and was back to designing sets and building props for stage productions. About that time I came across a toy magazine. (Sadly, a now defunct title, though it wasn’t Lee’s or Tomart’s, and ToyFare was just a glimmer in Gareb Shamus’ soulless eyes.) 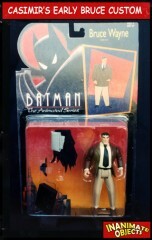 Inside were photos of custom figures made by fans, many complete with cards. 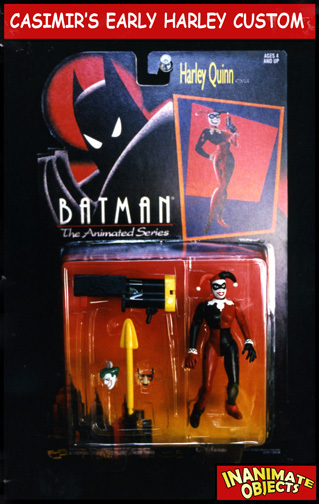 I had never seen anything that looked so “real,” especially the Harley Quinn custom shown. I thought “Heck, I can do that.” And so I did. Thus did I set upon a long road that led me here today. Skip ahead ten years. I’m conversing with noted Bat-customizer Scooter, a swell fella I’ve known for some time. 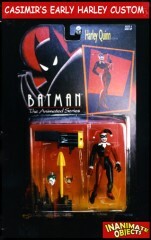 Turns out he made the Harley Quinn custom that inspired me to take X-acto to plastic in the first place! All this time and I never knew that Custom was his. I felt like I’d just been handed the last piece to a difficult puzzle. A few days later I come home to find a mysterious box on my doorstep. Inside was the very same Harley custom seen in that magazine ten years ago! Scooter thought she belonged in my collection. Needless to say, I was honored. Sure, she’s a bit rough around the edges, as Scooter’s skills (and mine) have vastly improved since then, but it’s what she represents that’s important. This little figure was what started me in this crazy hobby. 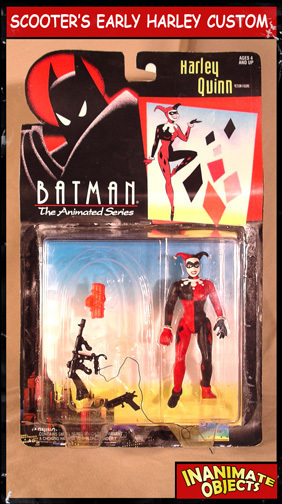 All my customs, this site, and indirectly those I’ve inspired can all be traced to this re-painted and re-shaped Catwoman figure. So, my thanks and appreciation go out to Scooter, too. Thanks for getting so many of us started! (Scooter’s an excellent customizer as well, and I’ll have a link to his site up once he says it’s ready.) And thanks for the Harley custom! I hope you’ve enjoyed this little story. Scooter wanted me to reiterate that these are old customs. We can do much better now!